Sometimes you need to block the air coming through a heater duct vent. This guide is about covering heat registers. To stop cold air leaks from coming in your unused heat register vents just cut up one of those large magnetic calendars for your fridge. I got 3 covers from a Dollar Tree calendar. You can paint them if you choose. 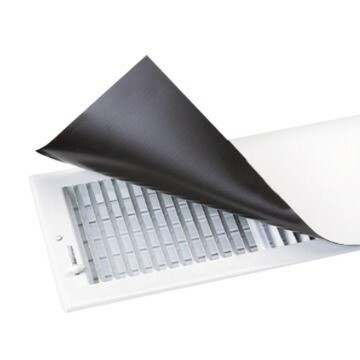 Magnetic Sheets is a great way to cover a heating/air conditioning vents! We rent an older home, and most of the heating/AC vents are rusted wide open. Since our landlord isn't interested in fixing our oven, we know she's not gonna repair the small stuff, either. Most of the time, the vents are fine as-is, but the one under my sewing table either roasts or freezes my feet, depending on the season. I've often found magnet sheets at Dollar Tree, and lucked out yesterday. Bought a package of two 6-inch by 9-inch magnetic sticker sheets, and trimmed one to fit the vent. Perfect! My feet are happy, the magnetic surface adheres to the vent without sticking up and catching on anything else, and if I want to, I can even use the adhesive side to decorate the thing. And it's easy to remove anytime. The magnet side is down, faces away from my sewing machine and is far enough away so it doesn't affect any computerized sewing functions. The strip I cut off the sheet to fit the vent will be featured in the Craft idea I hope to write up tomorrow. I like to use it all when it comes to craft supplies! Using a flap from a cardboard box, cut it to fit over your furnace register. On one side of the flap, place two strips of magnetic craft tape. Place the flap onto the register with the tape side down. If properly sized, it should work nicely. I would suggest that you place the tape on the longest sides of the flap. I designed this tip to fill the need.